Project completed while in the employ of Balance Associates Architects. 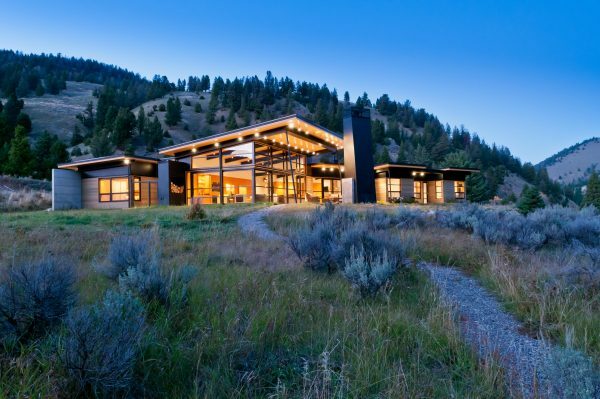 Once a preferred fly fishing location known only to the locals, the clients owned this remote property on the bank of the Gallatin River, near Big Sky, Montana for a number of years before electing to move forward with the construction of a 3400 SF full-time residence. The view and climate dictated the design and form of the home; it is oriented toward the best views of the river while maintaining good solar orientation to maximize solar heat gain in the winter and keep the hot summer sun out. The slight break in the building form was introduced to extend the views, define guest spaces, shape courtyards and create protection from winds and the sun in the front and back of the home. A large corner sliding glass door and cantilevered window system create a seamless transition between interior and exterior and draws the landscape in. Due to the size and remote location of the property, a horizontal geothermal heating system was determined to be an economical and efficient way to heat the home during the winter months.